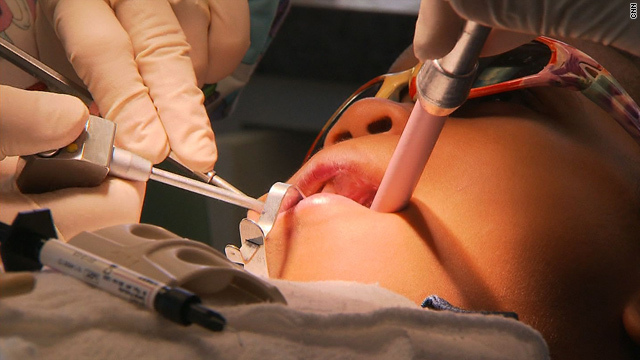 Dental sealants expose tens of millions of American children to the controversial chemical BPA, according to a new paper in the journal Pediatrics. It says that sealants contain derivatives of BPA, which metabolize to actual BPA when exposed to saliva. The exposure lasts up to three hours after the sealant is applied. Sealants came into widespread use in the 1990s. The American Dental Association and the Centers for Disease Control and Prevention recommend them as an important way to prevent tooth and gum decay. A host of health problems are associated with decay. Dr. Philip Landrigan, one of the paper’s authors, agrees that those benefits outweigh the risk from BPA, but warns that doesn’t mean the chemical is safe. “It is absolutely clear that bisphenol-A is a toxic chemical and an endocrine disruptor. We know this from studies in humans, and in animals,” says Landrigan, a pediatrician at the Mount Sinai School of Medicine who has spent decades studying the effects of chemicals on children. BPA is used in many plastics and also widely used in the lining of metal cans. It has been under scrutiny for possible links to a variety of health problems, including heart disease in adults and developmental problems in young children. Because it mimics the hormone estrogen, some physicians say it can cause disruption at very small doses. Dr. Abby Fleisch of Children’s Hospital in Boston, the lead author of the Pediatrics paper, says it’s unclear how much BPA children generally absorb from the sealants. The paper also urges pregnant women to minimize their exposure. Both the American Society for Reproductive Medicine, a group of OB-GYNs, and the American Dental Association (ADA) say they currently make no recommendation on sealants. Dr. Leslie Seldin, a second-generation dentist and spokesman for the ADA, said the group does not consider BPA from sealants to be a hazard. “What we found is that it can be controlled, it’s very minimal and it doesn’t pose any risk to anybody,” Seldin said. Precautions include temporarily blocking off the sealed area with a rubber dental dam, rinsing the mouth with water or saline solution and using a mild abrasive to grind off excess material. Other dentists agree. Dr. Joel Berg, chair of Pediatric Dentistry at the University of Washington, strongly believes sealants are safe and effective. "There's more estrogen in a mother's kiss than there is in a sealant," he says. Vom Saal says parents are in a tough position, one he wrestled with when his own daughter had some tooth decay. In the end, he had her dentist apply the sealant. Next entry »Secondhand smoke exposure 'striking' in the U.S.
As with many things, experts need to use risk-benefit analysis. In my mind, sealants are almost a non-issue. So dentists may determine that pregnant women should not receive sealants. But if dentists are going to treat dental caries as a medical model, as a JHDMD proposes, dentists will lose one of the treatment modalities in their arsenal (sealants). There's another bigger issue here that the article doesn't specifiy: BPA is present in composite resin, the "white fillings" that many patients now insist on (in place of silver amalgam). Maybe with that "knowledge" patients will now insist that their "white fillings" be replaced with silver/mercury amalgam ;-). Or maybe gold inlays/onlyas! Ka-ching! Lots more money for the dentist and more lost tooth structure for the patients (which leads to root canal therapy, extractions, additional prosthetics, etc.). My point is these are not simple issues. The big picture needs to be looked at, and mainstream dentists need to be the ones giving the advice. And what the heck is "gum decay" (mentioned in the article)? Since this article has been posted I have gotten some questions from parents. In our office we use a product that does not contain any BPA. Patients should ask about BPA free sealants. my gums are all messed up and i am now wondering if it is because of BPA? Hard truth...your gums are messed up likely because #1 you lack oral hygiene. and/or 2 you have a medical condition that is manifesting itself and showing it's nasty signs in your mouth. Diabetes being one of them. Leave it to the media to take a small study and blow it up to an overblown story. Fact remains that tooth decay is a public health epidemic. Tooth decay and pain resulting from is one of the top reasons children miss school. Parents should worry more about the candy and refined carbohydrates they are shoving in their children's mouths. Odd how these same people will think nothing of the effects of local anesthetic, bacteria associated with tooth decay and the risk of general anaesthetic when tooth decay goes so far that chilldren need to be hospitalized. Watch one child who lacked dental care get teeth pulled at the tender age of 6 and you will run to the dentist for your sealants. the positive effects of sealants far outweighs this perceived negative. so drink bottled water, get sore teeth pulled, and only get white fillings and you won't have any more worries. It's an alarming oral news, we should really be careful in picking dental clinic for our oral health to be safe and healthy. Our dentist should know what are the products that could harm and contains unwanted chemicals bad for our dental health. You have made your point, and I absolutely agree taking vitamin C everyday is very important. I was one of the kids that had weak teeth that was prone to cavaties & yes i brushed often and had regular check-ups. I went thru a lot of painful dental visits. I would definitely have my grandkids look into dental sealants. Valuable information. Lucky me I discovered your web site by accident, and I am stunned why this accident didn't took place in advance! I bookmarked it. Woah this blog is great i like studying your posts. Stay up the good paintings! You recognize, a lot of people are hunting around for this info, you can help them greatly. You've got a stunning portrait of Rebecca Van Dyck. From a Levi's Director of Marketing to Head of Marketing, Facebook, this lady should be a marketing genius.